M/E Engineering is pleased to announce the promotion of two of our key personnel to the position of Principal. Brian Danker, PE, LEED AP BD+C joined M/E Engineering in 2002 and has been an Associate/Partner in our Rochester office since 2011. With over thirty years of experience in consulting engineering, Brian will continue to oversee the company electrical standards and is responsible for project management with many of our collegiate and health care clients. Brian's team recently designed the MCC Downtown Campus, RIT Magic Spell Studios, Genesee Hall at the University of Rochester, and the Optimax Expansion. Brian is a graduate of Clarkson University with a Bachelor of Science Degree in Electrical Engineering. Brian resides in Fairport, and he and his wife Julie have four children and 2 grandchildren. David Schlant, PE, LEED AP, has over thirty years of experience in consulting engineering and manages the plumbing/fire protection standards for M/E corporate-wide. He has been with M/E Engineering since 1999 and has been an Associate/Partner with Brian since 2011. Dave is responsible for project management, engineering and design for a wide range of projects including Artspace Lofts & City Center in Trinidad, Colorado, the Emerson Culinary Arts High School, the Buffalo Zoo Arctic Exhibit and Reptile House, and Explore & More Children's Museum at Canalside. Dave is a graduate of SUNY Buffalo with a BS Degree in Mechanical Engineering as well as a Master of Business Degree. He is a Licensed Professional Engineer in 8 States, and also holds a Professional Engineer's license in fire protection in New York, Massachusetts and California. Dave lives in Amherst, and he and his wife Sue have two children. 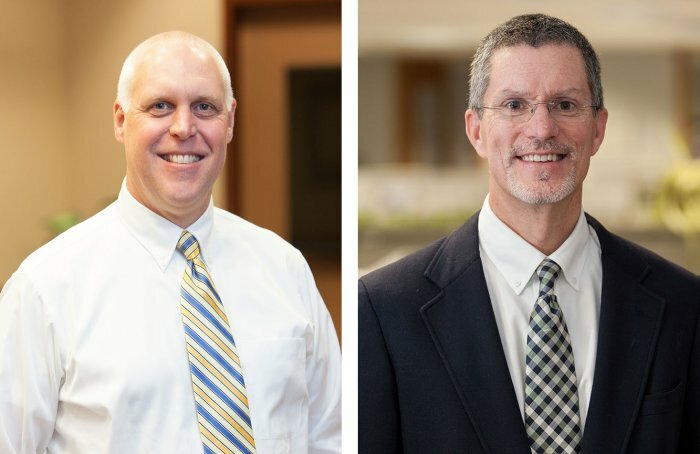 "Brian and Dave are consummate Engineers whose strong technical backgrounds have been invaluable in assisting clients to successfully complete complex projects on time and on budget. Their leadership qualities and commitment to guiding our staff have directly impacted M/E Engineering's success. Our growing business welcomes the efforts of their positive attitude, and contributions to our Leadership Team." Ronald C. Mead, PE, LEED AP, President - M/E Engineering, P.C.